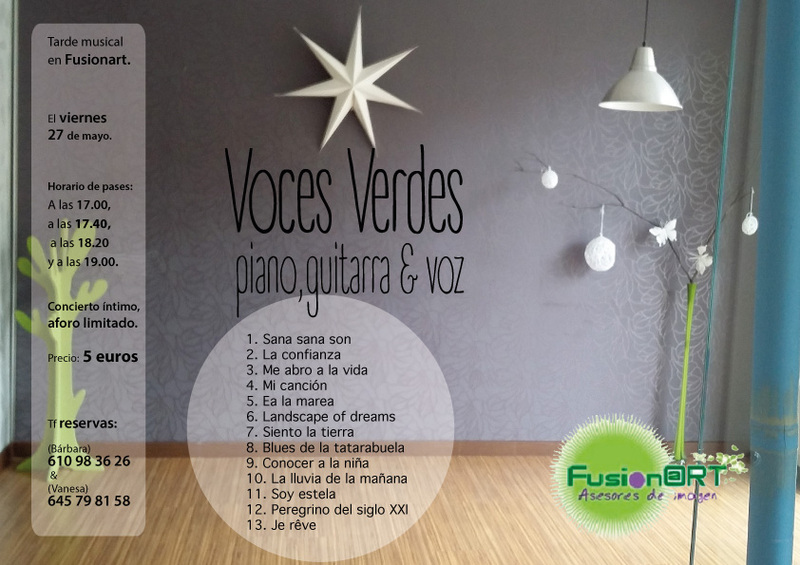 vocesverdes | VOCES VERDES en FUSIONART el viernes 27 de mayo. ¡¡TENEMOS BOLO EL VIERNES 27 DE MAYO!!. Y digo tenemos en plural porque la banda está en marcha. VOCES VERDES es nuestro nombre: piano, guitarra y voz constituyen la utillería por el momento.LUIS ” a secas“, así se llama el nuevo integrante de la banda, y Luis llega bluseando, valseando, vibrando a la guitarra ; una servidora a las teclas y las voces. Los silencios corren por parte de ambos . Si quieres hacer parte de la banda ,ya sabes, esa parte indispensable, la que escucha, la que siente, la que recibe y da su presencia, anímate a venir a FUSIONART , la peluquería de Vane el viernes 27 de mayo por la tarde. ¿ Que a qué hora nos vemos?, Haremos cuatro pases; a las 17.00, a las 17.40, a las 18.20 y a las 19.oo horas. Será un concierto íntimo de aforo limitado, así que, si vienes , has de reservar tu entrada. Thanks anon. you obviously know your stuff when it comes to this subject. Believe me, I am not one to let drug companies off the hook. I am quite aware of some of the crap that they do. But I still can’t blame anyone but this monster for this crime.r.j., we know that your state (Cali) has a sad history. I love my Aluminum Falcon, but my next car might be one of those tall wagons.I gave up on the idea of a truck when I realized that I only drive on roads and a $200 hitch mount and a cheap flatbed trailer make my minivan the equal of most trucks (my little trailer is 4'x8'. )Even more likely is one of the mid-size hatches, like a Mazda 3 or 5 or a Focus ZX5. I was introduced to your work through the first version of this article…I’m not a flickr star, probably I’ll never be, but anyway it helped me a lot to find out one great thing about flickr that I never had explored very well: the sense of community..Thanks for sharing so much information..
there was nothing they could do other than to provide us with names and addresses of our local representatives. Idea being that we could perhaps convince them to do the work and figure out which bureaucrats in NJ agreed to this without pursuing appropriate channels on the NY end (which would have led to adequate notification and potentially a different outcome). Was batteryparkcity.com able to get anything more intelligent out of 311?